While we do enjoy viiting a great tiki bar now and again, we’re usually more interested in checking out restaurants than bars unless the place has some other appeal to it. That appeal could be great design, a reputation for excellent food or something like the world’s largest gin selection – and I can sal that all of those things apply to The Flintridge Proper in La Cañada Flintridge. La Cañada Flintridge is far enough on the outskirts of Los Angeles that there is almost never any traffic getting up there, which makes The Proper a kind of hidden gem for people who don’t usually head to that neighborhood. It is well worth the drive. The bar specializes in farm-to-table food and has an extremely well-stocked bar that serves up craft and classic cocktails. 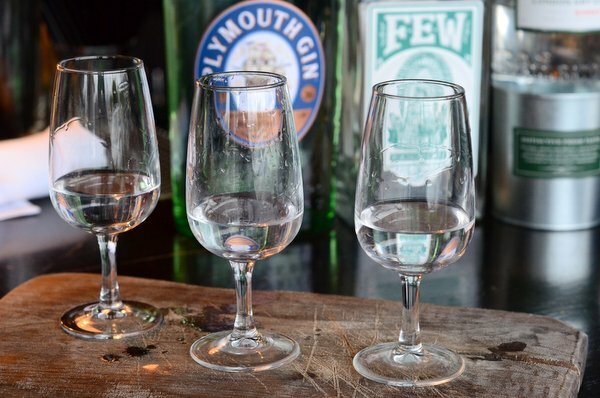 The thing that drew us in is the fact that they have the world’s largest gin selection, which happens to be one of my favorite spirits and one that is often under-appreciated by drinkers (because they’re used to the same few, inexpensive brands). Gin, however, is heavily featured in many pre-Prohibition classic cocktails because it was one of the most popular spirits at the time (and it also appears in many post-Prohibition drinks, of course). Changing up the type of gin that is in your cocktail can have a dramatic impact on the flavor of the drink, since gin – unlike other spirits – is infused with a variety of botanicals that gives each brand a unique profile. I knew that they offered gin flights that allowed you to compare the different styles, types ans flavor profiles of gin and was curious to try them. 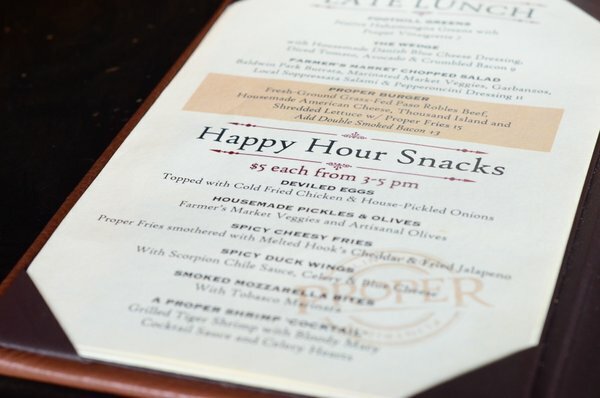 We headed up to the bar in the early afternoon for a late lunch and a chance to try the happy hour menu. They have a variety of drinks and snacks on their happy hour menu, but I already knew I wanted to try one of the gin flights, so we stuck to the happy hour snacks and ordered regular drinks. The gin flight I got, pictured at the top of this post, featured three different styles of gin: London Dry, Plymouth and New World. It was great to try the styles side-by-side (and the selections were very high quality), where I could easily pick out the differences between them. They were serve with tasting notes, too. Rob went with The Last Word, pictured at the bottom of the post. 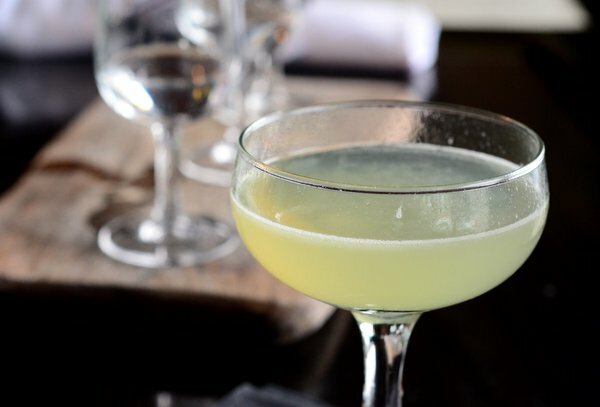 It’s a delicious classic cocktail made with gin, green chartreuse, lime juice and maraschino liqueur – and this is one of the few bars where the bartenders already knew the recipe well. 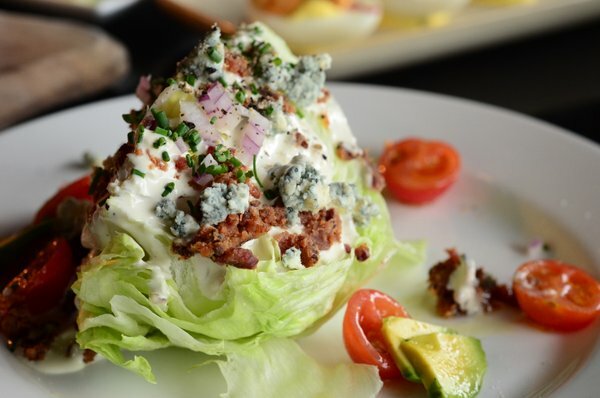 As for snacks, we started with a wedge (not on the Happy Hour menu) topped with bacon, blue cheese, avocado, onions and tomatoes. It was just the right size and was a delicious combination of flavors. We’re both wedge fans because they’re filling ans flavorful. They also, as it turns out, go quite well with gin. 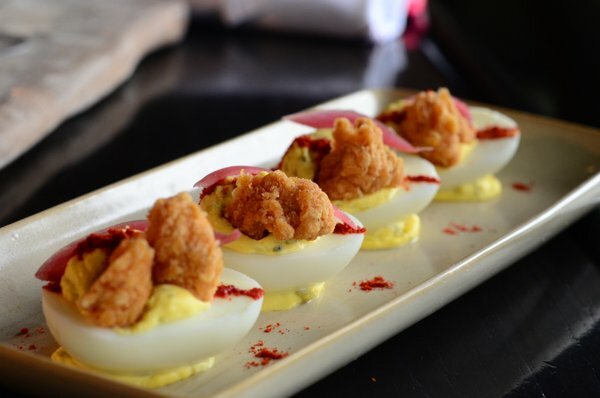 The Happy Hour snacks we got included deviled eggs topped with cold fried chicken, spicy duck wings and spicy cheese fries. The eggs were lick a whole picnic in every bite. 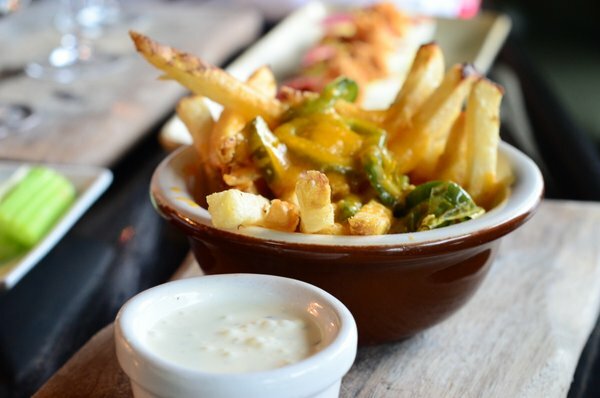 The wings were meaty, with a wonderfully crisp exterior and flavorful sauce, and the cheese fries were the perfect bar snack. When friends joined us later, we also sampled the delightfully chewy smoked mozzarella bites and the house-made pickles. 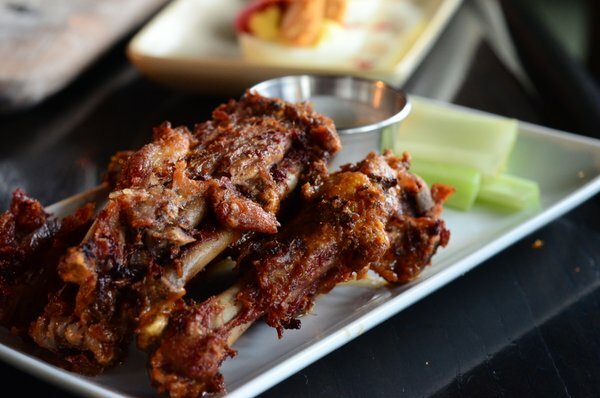 We’d probably order everything again, and Happy Hour is always a good excuse to get lots of finger food. I don’t have many photos of the interior of the space, showing off their bistro tables, plush leather-lined seats or the numerous nods to the neighborhood’s equestrian heritage, mostly because I had the wrong kind of camera lens with me the last time I visited. The loungy feel will put anyone at ease and gives it a feeling that is both warmly casual and sophisticated. We’ll be back for brunch (which friends tell us is delicious) and for another round at happy hour, since this bar is a great spot to meet up with friends and kick back on a lazy afternoon.